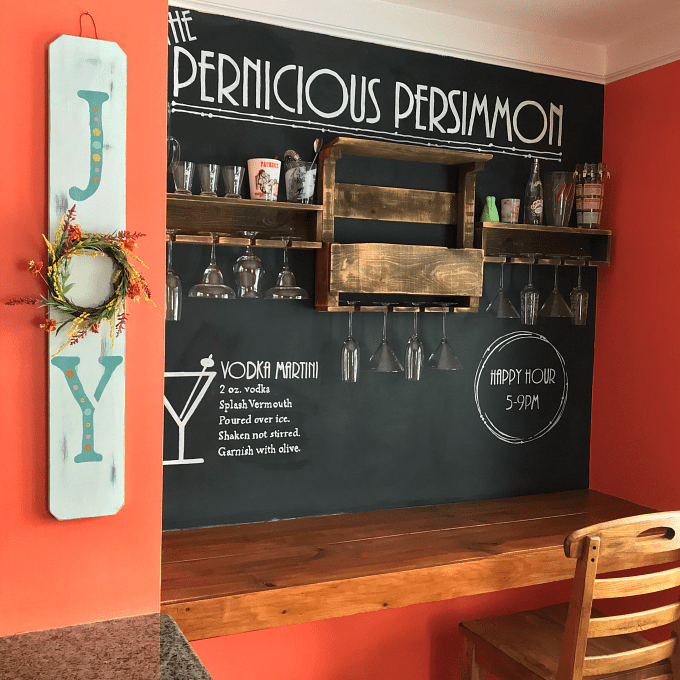 Chalkboards are extremely popular for any space: they are comfy for leaving marks, they inspire creativity and can fulfill various functions, for example, a storage function. 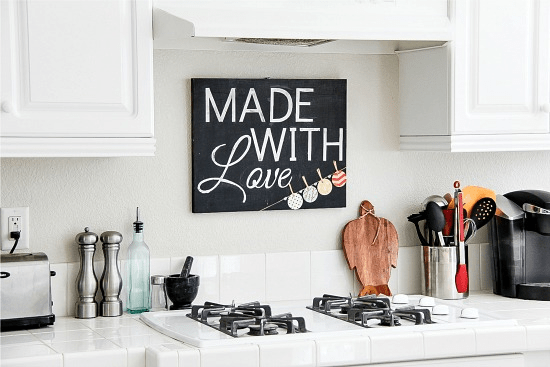 Today we are sharing some chalkboard DIYs for your kitchen – this is an often used space, which should be super practical, and chalkboards will help with that. If you have a plain kitchen wall, why not turn it into a chalkboard one? 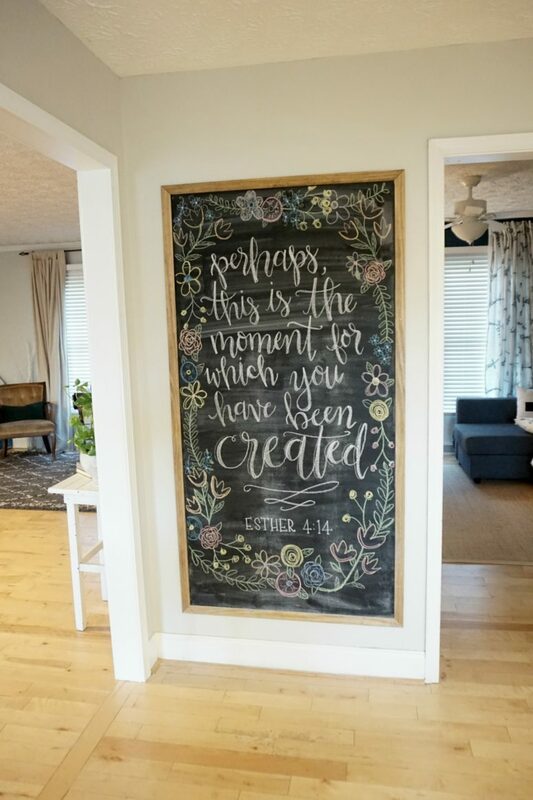 This one is a framed chalkboard that takes the whole board – such a great idea for those who love to create! Leave any images and messages you want and invite your kids to have fun while you are cooking. Wanna have a gorgeous bar at home? We have a brilliant idea for you! Make a chalkboard backsplash, add a couple of shelves with glasses and shakes and place cabinets or wine coolers under the countertop. How to make up the whole bar? Read the tutorial, which will tell you how to make a wall, shelves and pull off the whole thing. 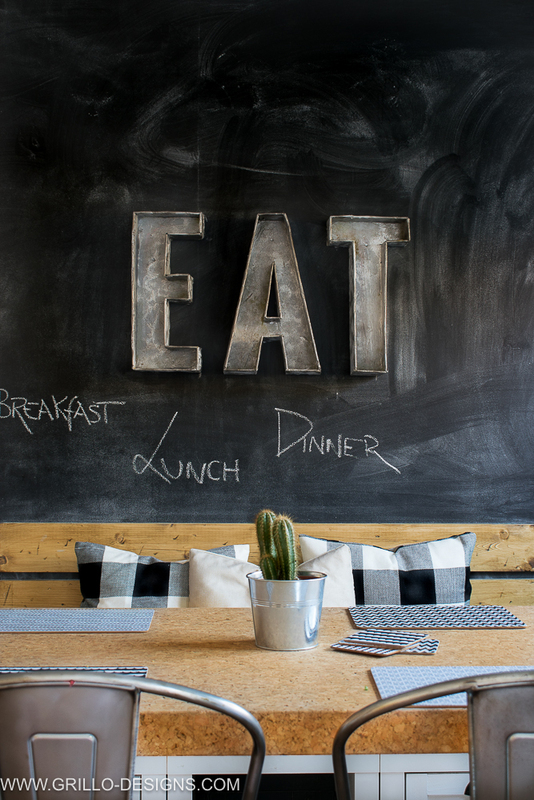 Spruce up your breakfast nook with a cool chalkboard wall! It can be used for art, for menus, various shelves to store some tea, coffee and spices and so on. How to make such a wall yourself? It’s not difficult, read the tutorial to make it! 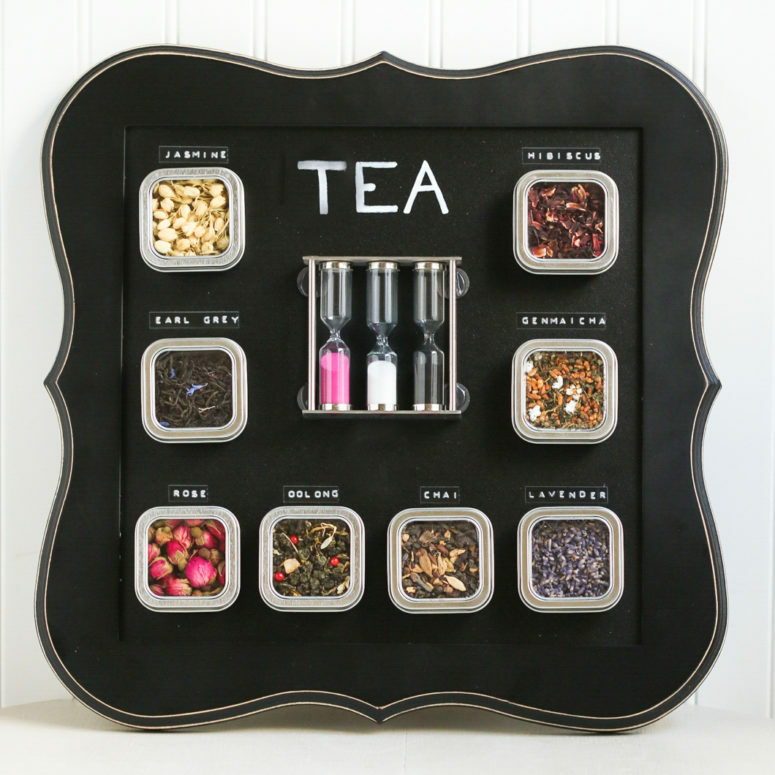 I have never seen such a cute chalkboard tea board! Take a chalkboard metal sheet to give it a look you like, or a ready metal chalkboard and put various types of tea into small containers. Attach magnets to each containers and chalk the names of the tea kinds. The chalkboard tea board looks very chic and will make tea drinking a fantastic experience! Enjoy! The same idea about creating a rack is used here but it’s not a tea rack, it’s a spice rack. The piece is made of a metal platter, which is covered with chalkboard paint. Put spices into small lidded containers and add magnets to them to attach to the rack, don’t forget to chalk up each container. 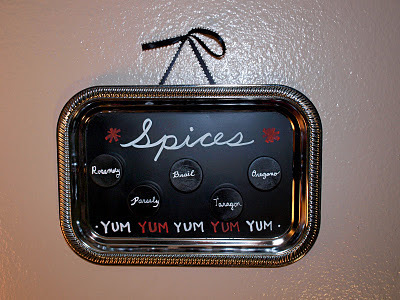 This cute chalkboard sign is a great idea to spruce up your kitchen and add a touch of fun to your space. The piece is stenciled with paint though you can use chalk and create what you like, and don’t forget a cute and colorful bunting to make it fun. 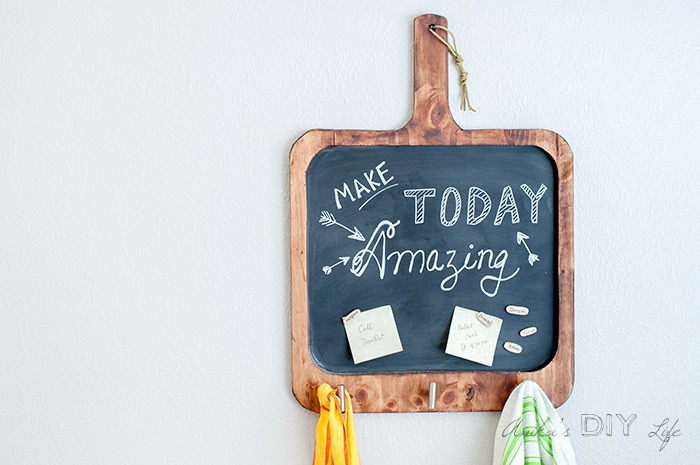 Add functionality and style to your kitchen with this cute magnetic chalkboard! It reminds of a usual cutting board but it’s magnetic and chalkboard at the same time, what a great accessory for a kitchen! The piece is made of a wooden board, metal and chalkboard paint, plus you can attach some hooks for aprons. Enjoy! A chalkboard in a frame is always handy for a kitchen: it can be used for a to buy list, for menus, messages and for kids’ art. Read how to make this large framed chalkboard and enjoy using it anytime you need – for all kinds of activities. 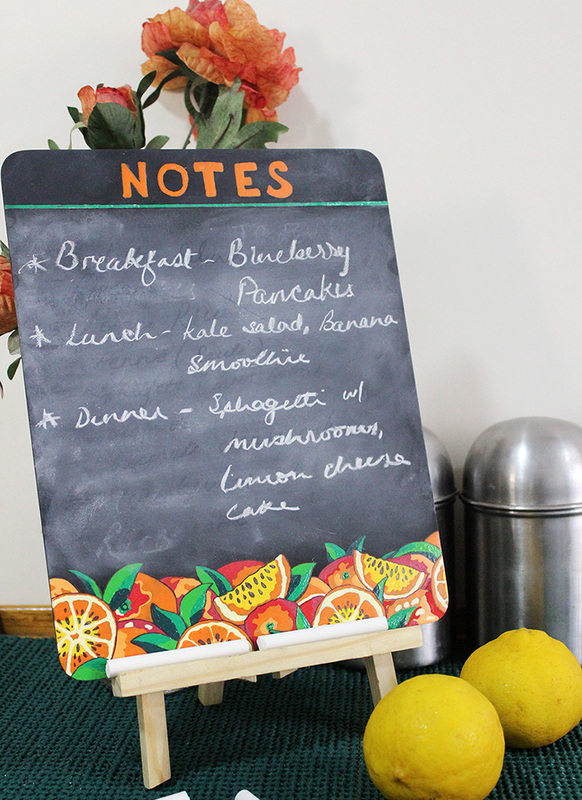 Turn a usual clipboard into a comfy in using chalkboard! Just take the clipboards and paint them – voila, nothing difficult! You may add a frame or something else for a cool look, or just leave it as it is and use for to buy lists, messages and menus whenever you want. I’m head over heels about this board! It’s not only a comfy board on a stand, it features a colorful fruity pattern, which was painted on it. I totally love that chic vintage look that it gives the board – if you feel creative, this is the project that you need. Get inspired and go make one! 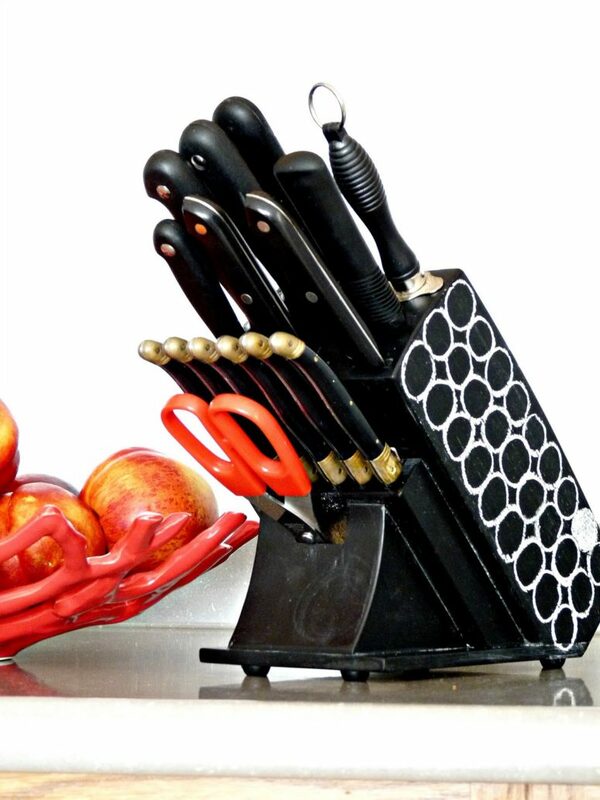 Make a usual knife block a cool and bold one with chalkboard paint and some chalk! Cover it, let it dry and feel free to leave any letters and patterns on it to make it amazing. This is an easy craft that won’t take much time and will add a personalized touch to your kitchen. 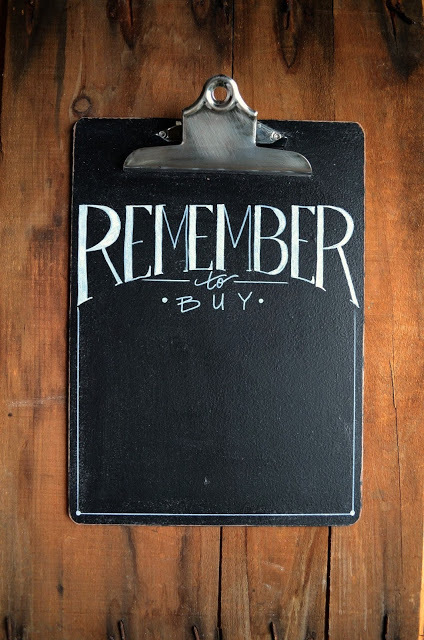 Do you always forget what to buy? No problem! 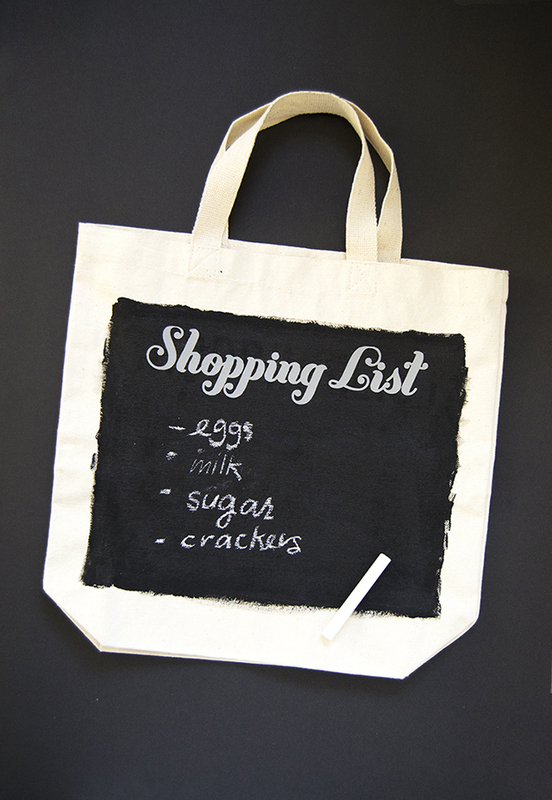 Make a chalkboard grocery tote and you will be able to chalk to buy lists right on the tote – easy-peasy! Buy a proper tote and cover it with chalkboard paint – that’s it! now write down what you need to buy. These chalkboard coasters aren’t only a super stylish accessory but also a cool gift for any holiday! 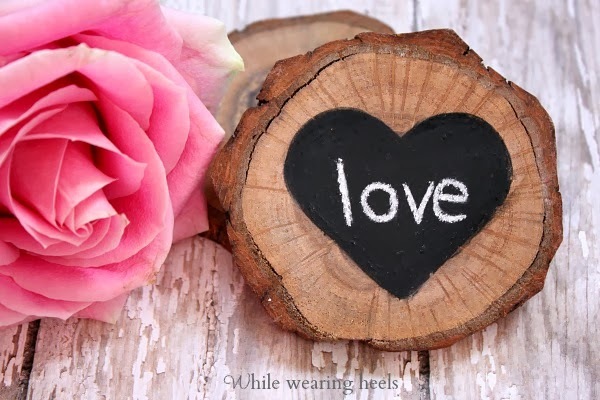 They are perfect for a rustic space as they are made of wood slices, all you need to do is to add chalkboard hearts to them and voila! Leave any messages you want, or make someone happy with this set of coasters! If you fele like sewing, then this tutorial is right what you need. 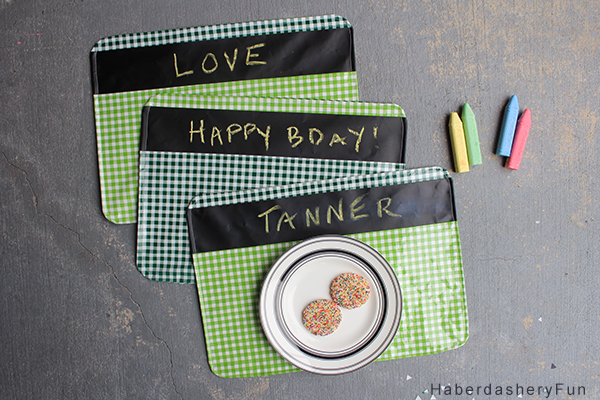 Sew these amazing placemats of some colorful fabric and add chalkboard fabric, too, to write down the names of the guests or those who are sitting at the table. Your kids will have a lot of fun while chalking something cute on the placemats. Make super elegant and chic spice jars using chalkboard paint. 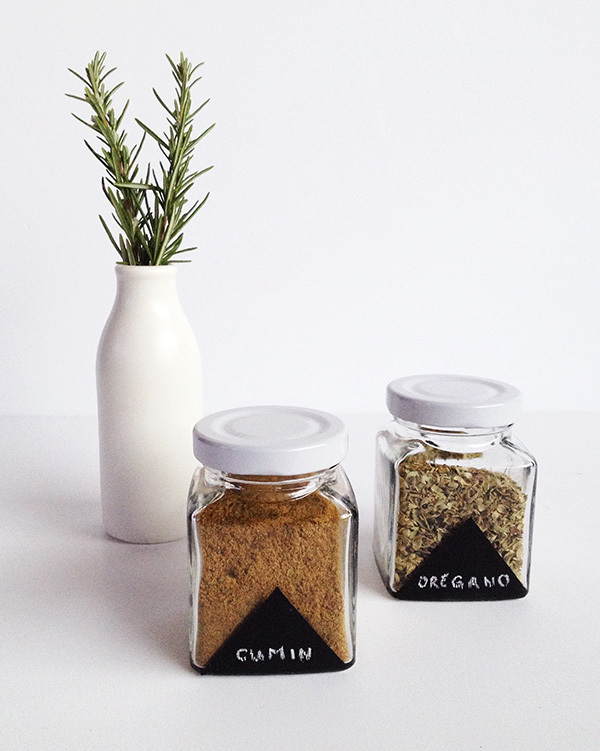 take usual mason jars and add chalkboard paint triangles, then chalk the names of the spices on the jars. You may change the design according to your needs and wishes. 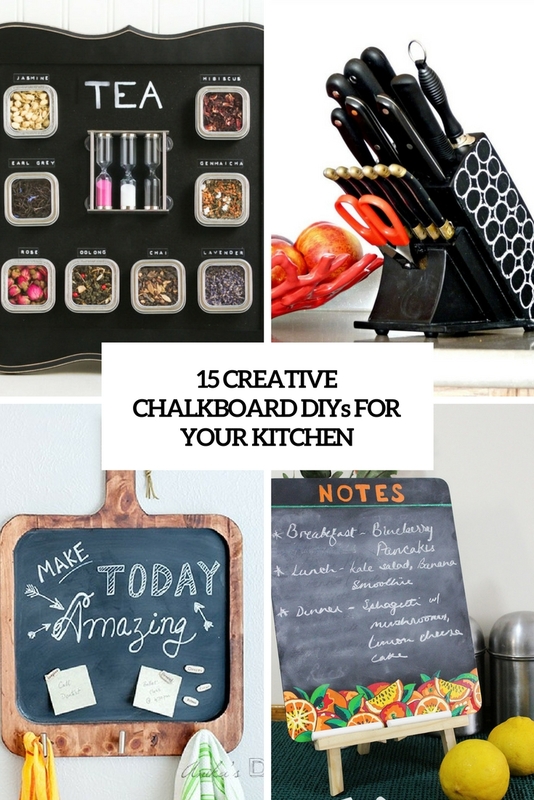 The post 15 Creative Chalkboard DIYs For Your Kitchen appeared first on Shelterness.